I haven’t exactly been faithful to blog about my fitness journey like I thought I would. It’s a daily struggle, much like being a Christian. Lots of joy in the journey, but I’d be lying if I didn’t say there were days I just wanted to give up because I’m tired of eating right, tired of getting up at 3:50 in the morning to workout, etc. But, here I am…still going 4-1/2 months in. I’ve lost about 45 lbs (haven’t weighed in a few weeks…at last weigh in, I was 296), but I can now see a visible difference in my clothing and in the way I feel in general. And others are starting to notice. I think one of the most frustrating things about being morbidly obese it that it takes SO long for the changes to show up and for others to even realize I’ve lost weight. I was in the gym working out a few weeks ago when one of the ladies came up to me and said that I was ‘melting’. I don’t see it myself…I look the same in the mirror. 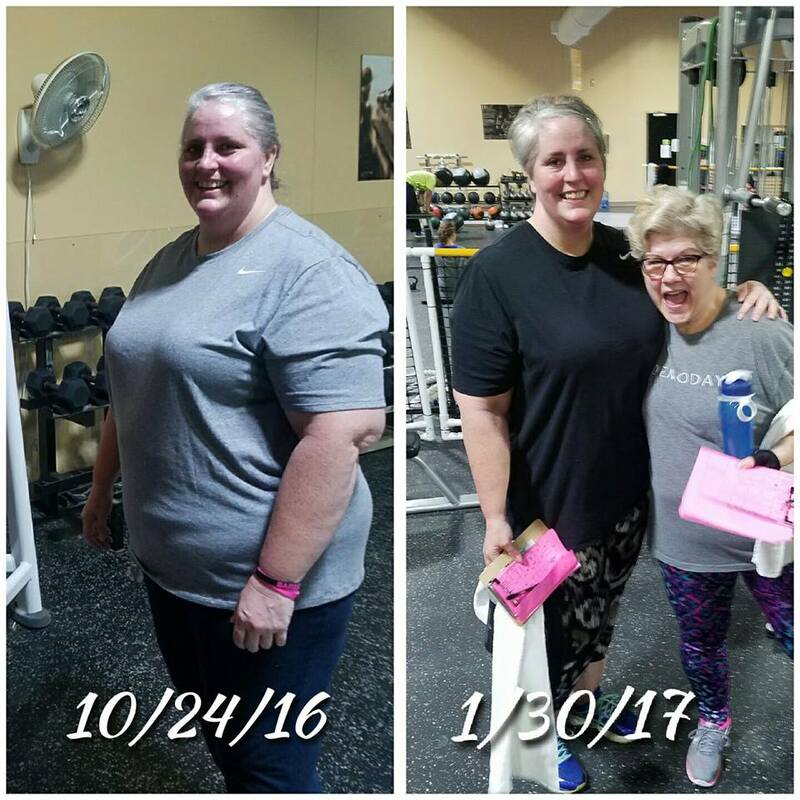 However, when I told my coach that, she posted a photo of my from my very first day in the gym on October 21st and one from that day. Okay, okay. I can see it now! So one thing I’m realizing is that taking photos is a HUGE part of this journey. I hate taking photos of myself. Hate it. But it’s so hard to see the progress if I don’t. And if I don’t see progress, I am in danger of quitting. I have injured my right shoulder somehow – possibly an impingement or a muscular deformity caused by overworking a certain set of muscles (too much pulling vs. pushing) and I’ve let my nutrition slide a bit in the last month…a little cheat here, a little cheat there. I have to get a handle on it, so I’m going to start tracking my macros using the IIFYM calculator.Â I can already see by using this that I’m not eating enough. I think that could be a big part of why my weight loss has stalled. That, and the cheats! So no more cheating (only one meal a week), and even though I’m unable to do anything for upper body besides biceps and triceps, I can still control most of my weight loss with food. My fatty arms might not transform as quickly as I want them to, but I’ll get there. I have to remember, the race I’m running isn’t a sprint – it’s a long-distance. I want to be able to continue to eat this way and workout this way for the rest of my life. So it will take time. And I am sure to get bored with the food or workouts. I am relying on Jesus to help me, because I just do not have it within myself to finish the race. There may be times we are running side by side, or times when He’s carrying me…but I know He’s there and I can trust Him to finish this work He’s started in me. 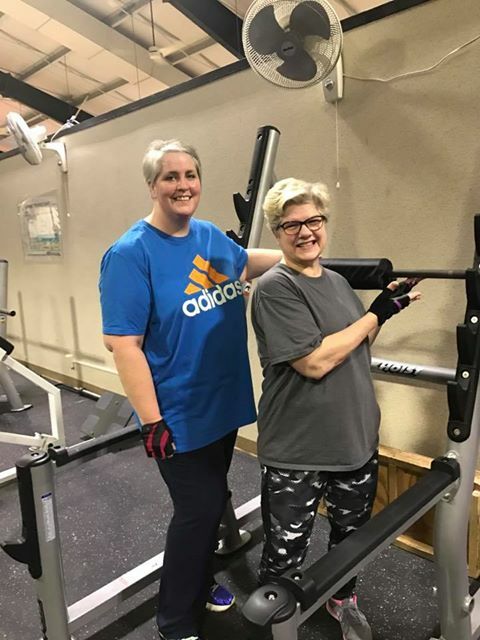 Here’s my workout partner Susan and I two weeks ago – right before I injured my shoulder. « Week 3 – Nutrition is Important!